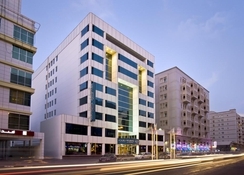 Located in Bur Dubai, the Four Points by Sheraton hotel is close to various red and green line metro stations, giving guests easy accessibility to all of Dubai’s top landmarks. 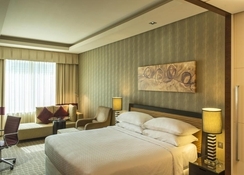 The hotel interiors are traditional and comfortable, which is suitable for both business travellers and families alike. The elegant rooms at the Four Points by Sheraton Bur Dubai contain a complimentary bottle of water, fruit basket, and in-room tea and coffee-making facilities. Indulge yourself by ordering dinner in the privacy of your room. The hotel boasts an award-winning restaurant – Antique Bazaar Indian Restaurant, which serves mouth-watering authentic Indian food, plus other popular eateries offering Italian and International cuisines. After a sunny day at the beach, head on over to the Viceroy Bar to have a refreshing drink or two. Being centrally located, the hotel enjoys a mix of artistic and cultural energies. Meena Bazar, Burjuman Shopping Mall, the Arabian Souk, Dubai Museum are just a minutes’ walk away. The glass-fronted building is a 3-minute walk from Al Fahidi metro station and 5km from both Dubai World Trade Centre and jewellery shops at the Gold Souk. The hotel offers 125 elegantly designed and furnished rooms. The rooms are categorised as Classic, Preferred, Executive and Grand Deluxe. Except for Grand Deluxe Rooms, all the remaining room types are further classified into smoking and non-smoking. The warm and modern rooms offer free Wi-Fi, flat-screen TVs and minibars. Upgraded rooms add iPod docks, custom-designed beds and sitting areas. Room service is available 24/7. Four Points by Sheraton Bur Dubai has a wide variety of dining options, each offering its own style and cuisine. A delicious and lavish breakfast buffet is served every morning. Guests are able to dine at The Viceroy – a proper English pub, offering international cuisine. Get a taste of authentic Indian cuisine at the Antique Bazaar Indian Restaurant, which serves up some of the best traditional dishes. Promenade serves a la carte specialities and La Terrace which offers light dishes. In addition, Ricetta offers the best Italian cuisine. 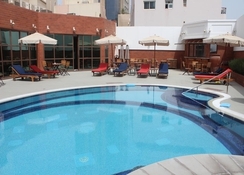 Regarding sports and entertainment, the Four Points by Sheraton Bur Dubai offers some choice to its guests. The hotel features a state-of-the-art gym with the latest cardiovascular equipment. 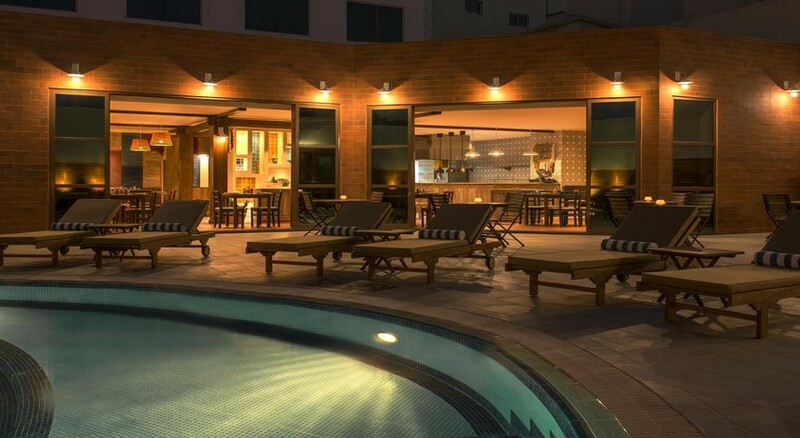 The hotel also features an outdoor swimming pool fitted with sun loungers. It also offers a sauna, whirlpool, hot tub and live entertainment. In addition, a hairdresser, a shop, as well as excellent conference and function rooms are available. For guests arriving by car, there is car parking and a garage. Two children under six years can stay at the hotel free of charge when using existing beds. Children under two years can stay at the hotel free of charge when using children's cots/cribs.